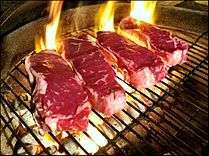 Roast beef is a dish of beef which is roasted in an oven. Essentially prepared as a main meal, the leftovers can be and are often served within sandwiches and sometimes are used to make hash. 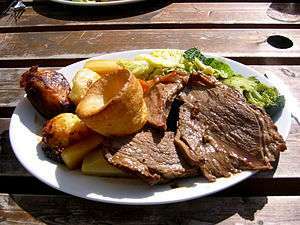 In the United Kingdom, United States, Canada, Ireland, New Zealand and Australia, roast beef is one of the meats traditionally served at Sunday dinner, although it is also often served as a cold cut in delicatessen stores, usually in sandwiches. A traditional side dish to roast beef is Yorkshire pudding. Translucent appearance is nothing to be alarmed about. Some prefer roast beef to be served "rare" or "pink", meaning that the center of the joint is cooked so that it retains a reddish color. Others prefer roast beef to be cooked medium or well done. The beef on weck sandwich is a tradition in western New York. 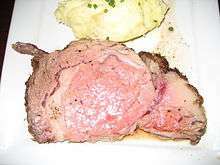 Roast beef is sometimes served with horseradish or horseradish sauce. In Denmark it is mostly used in open sandwiches, called smørrebrød. The roast beef sandwich commonly comprises bread, cold roast beef (either the leftovers from a homemade dinner or deli meat), lettuce, tomatoes, and mustard, although it would not be uncommon to find cheese, horseradish, fresh/powdered chili pepper and even in some cases red onion.